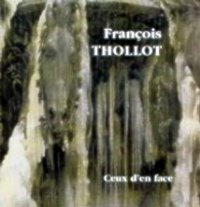 Thollot is a solo composer and musician hailing from Lyon, France, with no previous releases to his name, no membership in any known bands, and no session work… he basically comes fresh out of nowhere. He is a solo artist in the truest sense - composed and arranged all of the seven tracks, and played all the instruments (guitar, piano, bass, keyboards and drums) with no help from anyone. No vocals anywhere. Immediately after hearing the growling pulsating bass on the opening title track, I said "yeah! This is zeuhl! "; of course I more than half expected it given the excellent track record of the label that released this. But my good friend Mr. L.H.Keeper disagreed with me, saying it was not zeuhl, but in fact chamber rock, pointing out some undeniable similarities with early Art Zoyd and Univers Zero. In fact I believe we are probably both correct; the sound here is a marriage of the two - the angular and dissonant melodics wedded to the minimalistic and cyclical tendencies (and did I mention the bass?) of bands like One Shot and (instrumental) Magma. Throw into the mix just a touch of the trancy jazz-guitar style a la Jean-Luc Chevalier (circa Saharienne or Tibet) and a lead guitar attack not unlike Marc Ceccotti (Edhels), and the result is something that is at once very powerful and potent, full of dissonance and energy, yet strewn with melody and engaging rhythmic patterns. A Very impressive debut indeed!